The best camera in the world is the one that’s always in your pocket. 1. How to take manual control of your iPhone camera. 2. How to create strong composition. 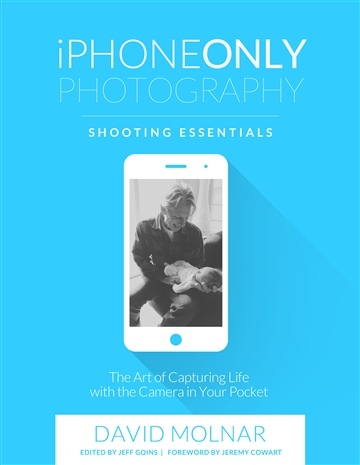 iPhone Only Photography: SHOOTING ESSENTIALS is a condensed version of my full book iPhone Only Photography that comes out very soon! David Molnar is a husband, new daddy, author and a music and advertising photographer. His work has been seen on Pepsi cans, in People Magazine, Real Simple Magazine, The New York Times, and on American Idol. His clients include Dolby, Sony, EMI, March of Dimes, Cracker Barrel, Atlantic Records, and more. David travels the world photographing, speaking, teaching, and telling cheesy jokes while wearing his signature blue V-neck. He also serves on the board of directors for KnowThinkAct.com, a non-profit committed to empowering local leaders working to end extreme poverty in Africa.